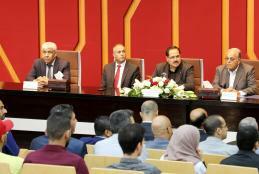 The universities – AAUP, Palestine Polytechnic, and Al-Quds celebrate the launch of Joint Ph.D. Program in Information Technology Engineering the first of its kind in Palestine, which was recently accredited by the National Commission for Accreditation and Quality at the Ministry of Education and Higher Education. The ceremony which was hosted by the Arab American University campus in Ramallah, was attended by the Minister of Education and Higher Education Dr. Sabri Sidem, President of Arab American University Prof. Ali Zidan Abu Zuhri, President of Al Quds University Prof. Imad Abu Kishk, President of Palestine Polytechnic University Prof. Imad Al Khatib, Minister of Communications and Information Technology Dr. Allam Mousa, The Minister of Jerusalem Dr. Adnan al-Husseini, and the Chairman of the Higher Council for Creativity Prof. Adnan Samar, And Minister of Local Government Dr. The Minister of Health Dr. Jawad Awad announced that Arab American University has received accreditation of two Dental Residency Programs in Oral & Maxillofacial Surgery and Prosthodontics, after its recognition by the Palestinian Medical Council. As he praised the efforts of the university, saying that this recognition is a pioneer in the academic development, especially in the disciplines and the medical fields. This special announced was during his speech at the opening ceremony of the Medical Center, that contains (the Dental Center, the Genetic Genetics Center and the Analysis Lab) at Arab American University - Ramallah campus in the presence of Chairman of the Board of Trustees of the University Dr. Mohamed Ashtia, Dr. Yousef Asfour Chairman of the Board of Directors, the Governor of Ramallah and Al-Bireh Dr. Laila Ghannam, President of the University Professor Ali Zidan Abu Zuhri, Assistant Undersecretary for Higher Education at the Ministry of Education Dr. The Minister of Education and Higher Education Dr. Sabri Saidam announces the accreditation of the Electrical Engineering and Renewable Energy Program at the Arab American University. He also stressed on the university’s initiative to offer 10 scholarships to students of the Red Khan Society, a threatened area to be demolished and removed by the Israeli occupation forces. In the presence of the University President Prof. Ali Zidan Abu Zuhri, Palestinian Engineers Syndicate President Dr.